I had yet to delve into the beauty area of Etsy until I tried out Bahari Blossom. I decided on a lip balm as my lips are constantly cracked and peeling no matter what I use on them! 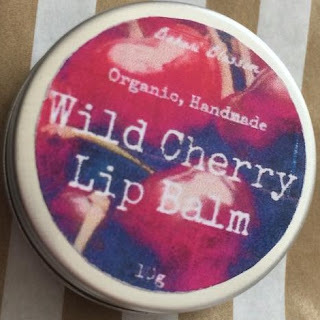 Cocoa butter is prominent in the formulation of this lip balm which is evident when using it as you kinda have to wait for your fingers to melt the lip balm when you want to get some product out. The cocoa butter also means that it's really nourishing on the lips and the moisture sinks in rather than sitting in a layer on the surface of your lips. The cherry scent is lovely as well, I don't usually go for cherry scented things but this isn't too artificial smelling - it's just nice and sweet.